Southwest Airlines today announced its bookable flight schedule has been extended through June 8, 2019. The extension brings an additional new nonstop route linking San Jose, California, and El Paso once weekly on Sundays beginning April 14, 2019, as well as resuming Sunday service between San Jose, California, and New Orleans. The carrier will resume daily seasonal service on April 8, 2019, between Dallas Love Field and Pensacola, Florida. Kansas City, Missouri, and Pensacola, Florida. Fall Flights – Ready for Take Off! On Saturday, October 6, 2018, the carrier also will begin seasonal nonstop service weekly on Saturdays between Cleveland and Orlando, and Milwaukee and Fort Myers, Florida. The following day, the carrier will launch Sunday-only service between Oklahoma City and Nashville, Denver and El Paso, and Oakland, California and Tucson, Arizona. Top Copyright Photo: Southwest Airlines Boeing 737-7H4 WL N417WN (msn 29822) SNA (Michael B. Ing). Image: 943664. 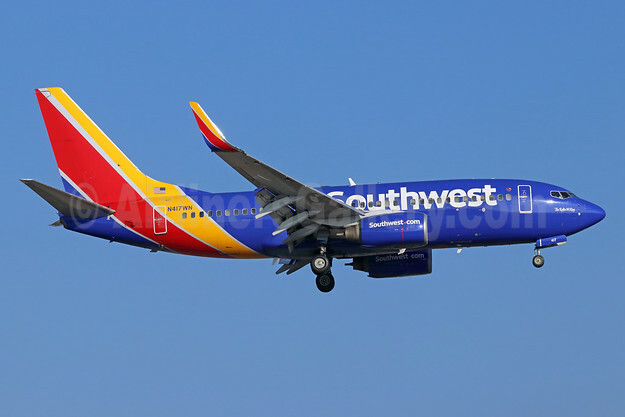 This entry was posted in Southwest Airlines and tagged Boeing 737-7H4 WL, msn 29822, N417WN, Southwest Airlines on September 27, 2018 by Bruce Drum.